General der Gebirgstruppe and Commander of LXXXXVII Army Corps. 18-08-1947, age 57, hanged, in Laibach in Ljubljana. In Ljubljana, but a Memory stone at the Westfriedhof Munich, family grave Kübler. Kübler, Ludwig, born 02-09-1889 in Unterdill, Bavaria, about five months after Adolf Hitler (did you know) His father was the physician Wilhelm Kübler who died age 46 on 04-06-1919 in Dresden and he had six brothers and two sisters. In 1895 he enrolled in elementary school in Forstenried which he left after three years, he then attended the Gymnasium in Rosenheim and the humanist Ludwig Gymnasium in Munich . He graduated in 1908 with top grades and turned down a place at the prestigious Maximilianeum for a career in the military and joined the 15th Royal Bavarian Infantry Regiment “King Friedrich August of Saxony” as a cadet on 20-07-1908, age 18. From 01-10-1909 until 14-10-1910 he attended the War School in Munich at which he was placed fifth out of 166 students in his year. On 23-10-1910 he was commissioned as a leutnant. At the beginning of the First World War he was serving with the 15th Royal Bavarian Infantry Regiment “King Friedrich August of Saxony” at the Western Front and was involved in September 1914 fighting in Lorraine and around St Quentin as commander of a machine gun platoon. On 24 September he received a wounded badge for a serious injury from “shell” splinters who left a conspicuous large scar on his face, under the nose, but it appeared that the wounds were of flying pieces of a hit stonewall. Although the injury had not completely healed he returned on 13-01-1915 to his regiment, which took part in the Battle of the Somme. 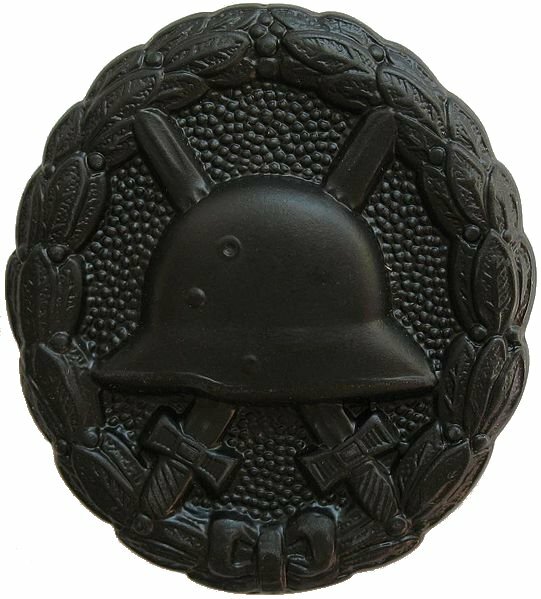 In his first months on the front Kübler earned the Iron Cross 1st and 2nd Class, 16 September and 17-11-1914. From the 21-09-1915 he was the adjutant of his regiment and remained so for most of the war. On 18-08-1918 he was appointed a battalion commander in his regiment and promoted to the rank of Hauptmann. All six Kübler’s sons served during the first war and three were killed, Dr. Wilhelm Kübler in France, born 17-01-1887, Fritz Kübler, also in France, born 02-11-1887 and Leutnant Franz Kübler in the Flanders fields, born 16-09-1897. After the war he was retained in the Reichswehr . Nazi Germany started almost immediately with rearmament. The scope of the Reichswehr was limited to 100,000 men by the provisions of Versailles. It had no tanks, no air force and barely any ships. Six years later, at the outbreak of hostilities, the Wehrmacht had 3.5 million soldiers, 9,000 cannon, 2,500 tanks, 2,300 aircraft, 57 submarines and 45 surface vessels. He was then a staff officer in the Army Department (T1) of Truppenamt for a few years. From 1925-1926 he was at the General Staff of Group Command 1 in Berlin. In the autumn of 1933 he was on the staff of the 7th Division of the Reichswehr in Munich and on 01-10-1934 was appointed the Chief of Staff of the VII Army Corps in the new Wehrmacht. On 01-06-1935 he was commander of the Mountain Brigade, the 1st Mountain Division . The Mountain Divisions had famous commanders like Generaloberst der Gebirgstruppe, Eduard Dietl. General der Gebirgstruppe, Hans Schlemmer, General der Gebirgstruppe, Carl Le Suire and Ludwig’s younger brother Josef Kübler. Ludwig Kübler, a heavy smoking man, was the architect of the Mountain Troops like Generalfeldmarschall der Flieger, Erhard Milch was of the Luftwaffe, Generaloberst der Flieger, Kurt Student of the German Para Troops, and Generaloberst der Panzertruppe, Heinz Wilhelm Guderian of the Panzer Troops. At the start of World War II he was awarded the Knight’s Cross of the Iron Cross for his role in the Polish campaign. Then on 01-12-1939 he was promoted to General Leutnant. As Commanding General of the new XXXXIX Mountain Army Corps he was earmarked to lead the cancelled conquest of Gibraltar and was then in the summer of 1941 involved in the attack in southern Russia and was transferred from General der Infanterie to General der Gebirgstruppe. Men of Kübler’s Gebirgstruppe saw there how Generaloberst der Infanterie, Robert von Schobert and his pilot Hauptmann Suwalack, landed in a Russian mine filed and burnt to death. Kübler had to leave his Gebirgstruppe and was then appointed, a thousand kilometers away, as commander of the threatened 4th Army in the battles for Moscow, in the bad weather and dwindling forces and material, but this was to much for the simple Kübler . After 4 weeks of retreating battles Kübler, with Hitler’s last orders of holding the front under all circumstances, was so disappointed and despaired, that he in January 1942 wrote his frustrations and doubts in a letter to his wife in Germany. His gossip wife Anna Maria, with whom he had two daughters, Elisabet “Lilli” and Marianne, went to the friendly General Rudolf Freiherr von Waldenfels in Munich and told him the attitude of here doubting husband, which von Waldenfels passed on very quickly and the message soon reached Hitler. Hitler who had already doubts about Kübler, ordered Kübler to his headquarters and spoke to him like a bad boy and took his command of the 4th Army and replaced him by General der Infanterie, Gotthard Heinrici, who wonderwel succeeded to stabilized the same threatened front. General von Waldenfels died age 73, on 14-08-1969, in Rottach Egern. Kübler was moved to the Hitler Reserve and did not receive another command until the summer of 1943 and a year later he was appointed commander of LXXXXVII Army Corps, where his replaced General der Infanterie, Max von Schenckendorff , who died of a heart attack, age 67, on 06-07-1943. Kübler, who now wanted to show his new fearless attitude to Hitler, became a merciless partisan hunter in Russia and against Tito’s partisans in Yugoslavia. Shortly before the end of the war he was wounded and captured in Yugoslavia, where he together with his successor Generalleutant der Gebirgstruppe, Hans von Hößlin, was sentenced to death in 1947, age 66, by a Yugoslavian court. He was hanged in Laibach in Ljubljana on 18-08-1947, like his younger brother, Generalleutnant Joseph Kübler. (1896–1947), who was also hanged in Ljubljana, Yugoslavia on 26-02-1947. Hans von Hösslin was hanged on the same day as Ludwig Kübler and the Austrian Generaloberst Alexander Löhr, age 61. In May 1964 the barracks in Mittenwald in Bavaria were named after General Kübler. In November 1995 Volker Rühe, then the German Minister of Defence, changed the name “General-Kübler-Kaserne” into “Karwendel-Kaserne”. In Mittenwald is buried another former commander of the 1st Mountain Division, Field Marshal, Ferdinand Schörner, the only Gebirgstruppe Feldmarschall. Burial ground of Kübler, Ludwig “Latschen-Nurmi”. There is a remembrance text on the Kübler family gravestone, on the Westfriedhof of Munich, where also are buried his wife Anne Maria, born Märkel, who died old age 86, on 23-06-1977 and his daughter Marianne, who died age 61, on 20-10-1988. Cemetery location of Kübler, Ludwig “Latschen-Nurmi”. Mountbatten, Louis Francis Albert Victor Nicolas "Dickie"